Which Boogie Board Writing Tablet Is The Best? In a world full of tablets, ever considered buying an e-writer or an LCD writing tablet? There are many different reasons why you should consider buying one of the Boogie Board tablets available. Kids love simple technology toys. A Boogie Board is great for creative expression. They also keep kids entertained and organized, too. Many Boogie Board tablets are designed with features and accessories for kids. However, there are versions of the tablet that are perfect for list-making parents and business professionals. Check the list to determine which e-writer is best for you and your individual needs. An e-writer, more specifically the Boogie Board Jot 8.5, is a very thin LCD screen. A "pen" or stylus, allows users to draw and write, just like pen on paper. Adults and teens will enjoy creating to-do lists and doodling. Parents will be drawn to the lightweight features and slim profile of the Jot 8.5, making it easy to keep in a purse for family travel or entertainment in a restaurant. The Boogie Board is environmentally friendly, as kids are not wasting excessive sheets of paper. The magnetic attachments on the back give this high-tech sticky note a home on the side of a refrigerator or on a metal door. The only drawback to an e-writer is, make one simple mistake and you may have to decide whether to erase the whole picture and start over, or use your imagination to make it work. You can not erase small details. In comparison to other technology, the Boogie Board is low-tech, but it has some great high-tech features. The Jot integrates with a smartphone app that will capture the contents of the screen. Drawings, notes and lists do not have to be lost forever once the erase button is pushed. Through the app, pictures and words written on the Boogie Board can be saved to a camera roll and emailed, texted or shared. 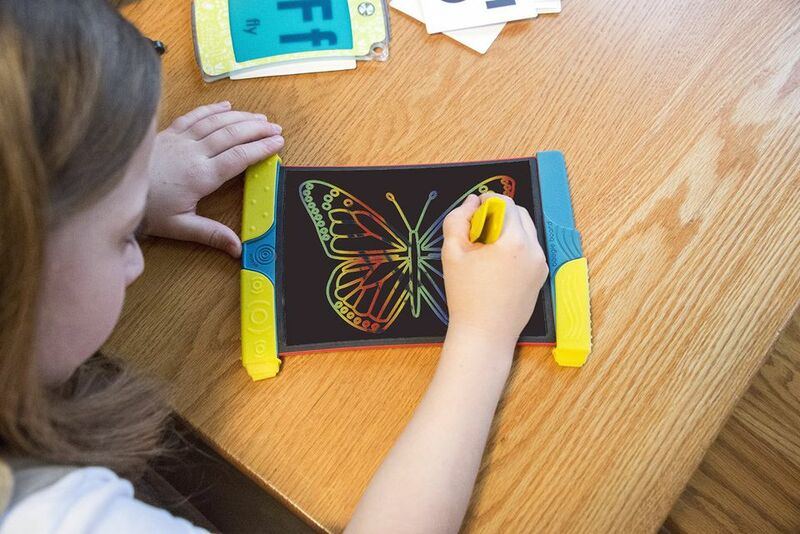 The Scribble n' Play includes the same features of the traditional Boogie Board Jot 8.5, but the writing surface underneath allows doodlers and creative geniuses to scribble and doodle with a rainbow effect. 4 different styluses, each with different drawing tips, are easy for young children to hold. Styluses store and firmly attach to the corners of the e-writer when not in use. Aside from doodling and creative expression, there are many educational activities kids can also use an e-writer for. 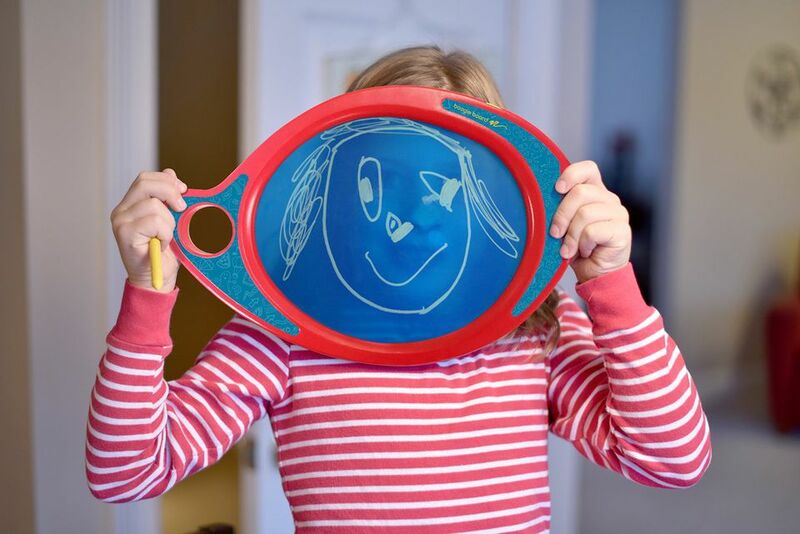 Boogie Boards are a high-tech version of an old school "dry erase" board. Maybe it is the darker colored screen, the "tech feel" of an erase button, or the ease at how the boogie board stylus moves across the board, but using a Boogie Board is fun and it does not feel like work. Many kids are excited to grab the tablet out of the hands of an adult and spell words and solve math problems. Building on the success and popularity of the Play N' Trace, The Jot 4.5 with Clearview uses the same clear writing surface, in a smaller, more portable version. The stylus easily clips and and attaches to the side of the e-wrriter. While older children might enjoy being more creative through drawing and tracing Disney Princesses or Star Wars characters, the Jot 4.5 also includes 20 different cards that are placed under the Boogie Board and encourage younger kids to learn letters and numbers as they trace over them. The Boogie Board Play N' Trace has a very unique shape. Some kids might think of it as their painter's palette, parents are so excited about the learning and educational opportunities. While it is not as vibrant as the traditional black screened Boogie Boards, the Play N' Trace has a special "clear view" surface. This screen does what other Boogie Boards can not, and it allows kids to trace. Kids enjoy tracing letters, numbers, and creating mazes. Different themed activity cards and re-usable clinging sheets, which are purchased separately, are placed on the bottom of the e-writer for kids to trace. Love the original Boogie Board Jot but for some reason but you think it's to big? The Jot 4.5 might be the perfect solution. The Jot 4.5 has the bright LCD screen Boogie Board users love, with the ability to easily slip into a pocket, purse, backpack, or the pocket in the backseat of a car for kids to use on-the-go. Families are often busy, spending time in the car, headed to appointment and sports. Why not maximize their time and practice spelling and math facts on-the-go!